For his birthday, I wanted a really good restaurant that's a bit different. He took me to Restaurant Andre, let's face it, I can't beat that. It's not a competition, he said. 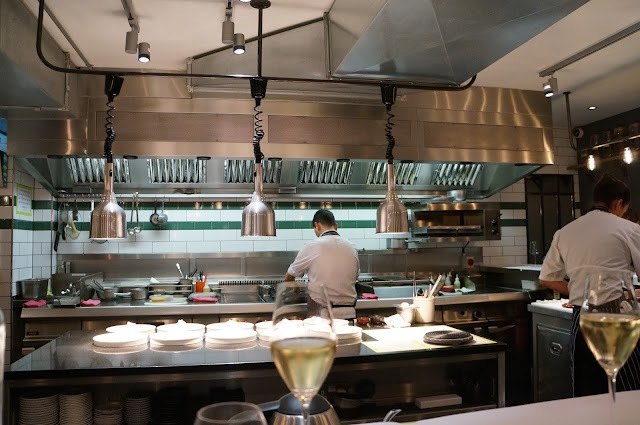 Kitchen Table is a chef's table behind Bubbledogs; 19 counter seats arranged around the kitchen so we could watch chef and his team churn out plates after plates of stunning food. The menu was written on the blackboard and it changes daily, depending what's in season and possibly what the chef has growing in his garden. 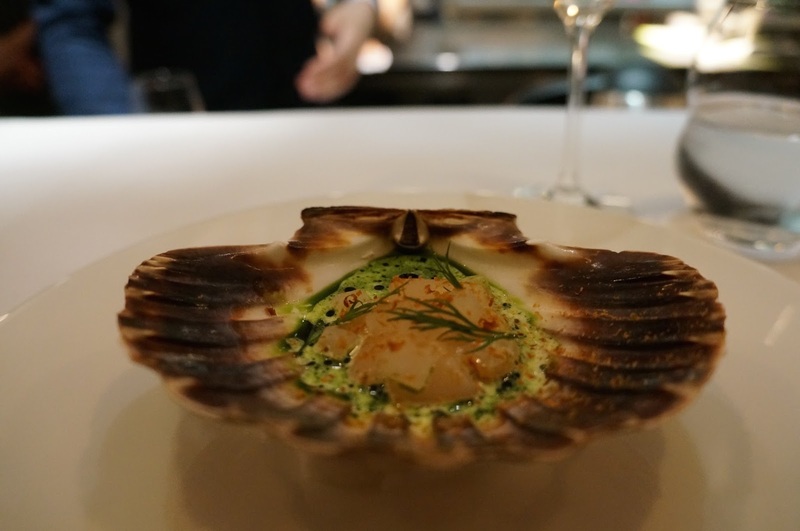 The scallop was served as a ceviche with smoked roe, burnt cabbage, dill and raw rhubarb for some crunch, drizzled with cream. A single leek roasted with a silly crusty case. We didn’t get it, possibly our least favourite of the evening. This is when things were starting to get more interesting. The ultra thin film of chicken skin melted on tongue, leaving a trail of fragrance from the grease. 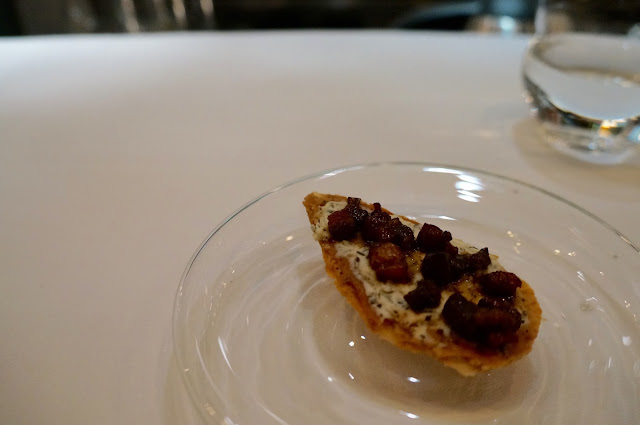 The creamy cheese was infused with herby aroma, wrapped around the small lump of candied bacon to rein in its sweetness. How could things go wrong with bacon jam. It was a delightful mouthful. 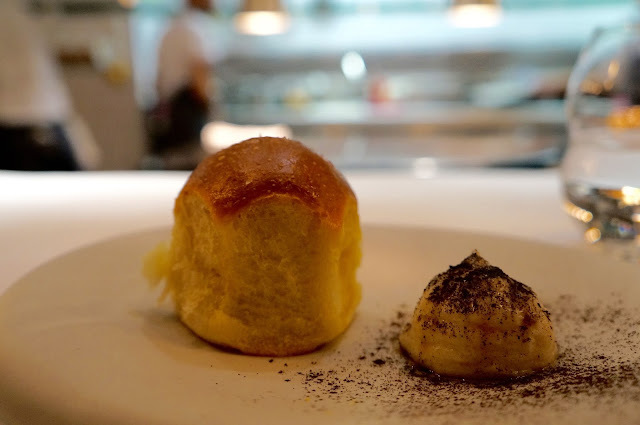 This was a milky bun, like brioche, buttery and fluffy, served with an airy butter sprinkled with smoked brill roe and paprika. The smear of burnt butter was indulgently rich, scattered with tarragon and raw succulent shrimps; the crunchy pickled carrots alleviated the heaviness and kept this course light. The roasted red peppers was made into an airy frothy broth, bursting with natural capsicum sweetness with a slight bitter undertone. 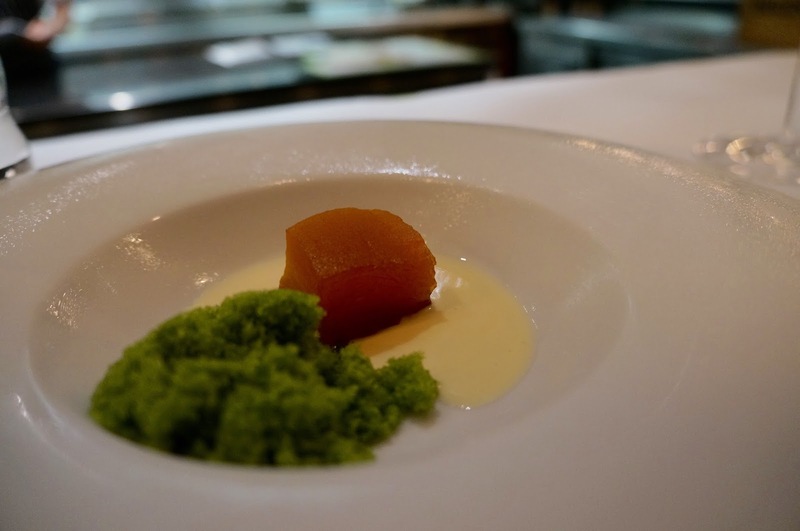 It was perfect with the beautiful fillet of red mullet, which was moist and silky, tasted incredibly fresh and clean. This seemingly simple combination was one of our favourites of the evening. 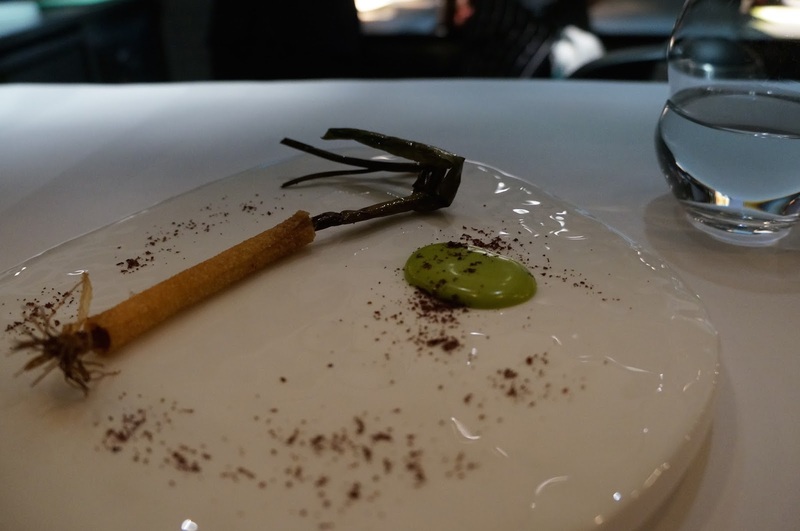 The lobster was an optional supplementary course at £25 each. We decided to share one. 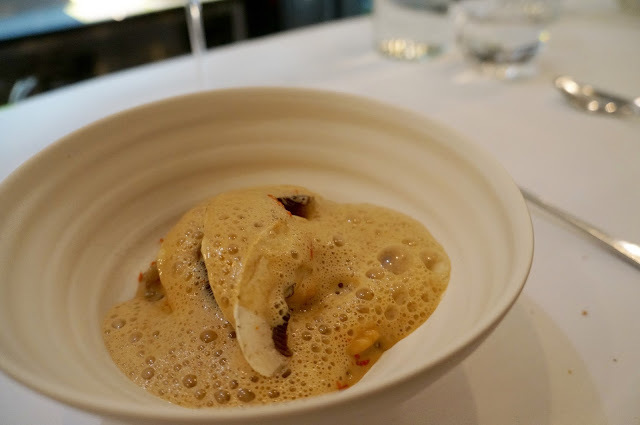 The muscular lobster meat was roasted in roe oil, softly springy and packed with sweet oceanic juice; served on a bed of chewy pearl barley and buckwheat that had absorbed the shellfish essence; covered in a blanket of crustacean emulsion, topped with raw crunchy mushroom and dusted with dried roe. It was pure pleasure of powerful seafood goodness. I had my eyes on the hunk of Angus sirloin slowly cooking over a low heat since I sat down. 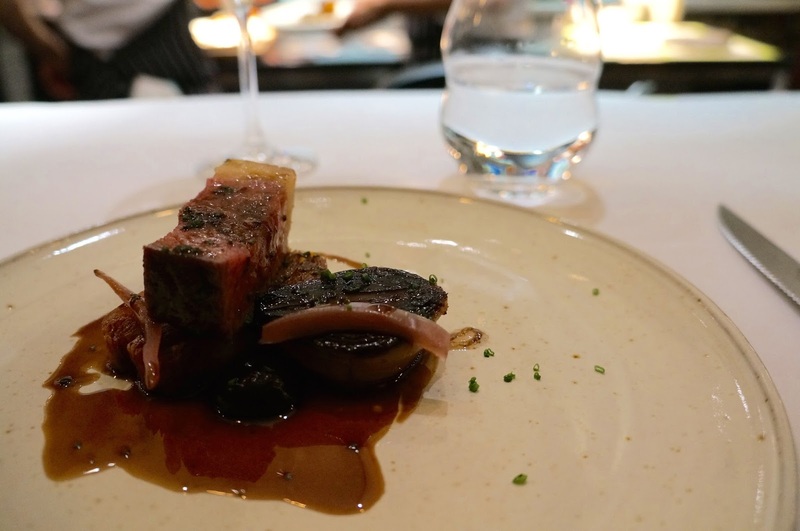 The chef effortlessly sliced the meat to reveal its ruby centre; the beef was tender and juicy, oozed intense flavours.the creamed potatoes were cooked in beef fat to draw out the bovine perfume, perfect with the black garlic globule and pickled onions. I drew the short straw and was given the end bit, marginally more cooked and marginally drier than others, but it was still pretty damn delicious. 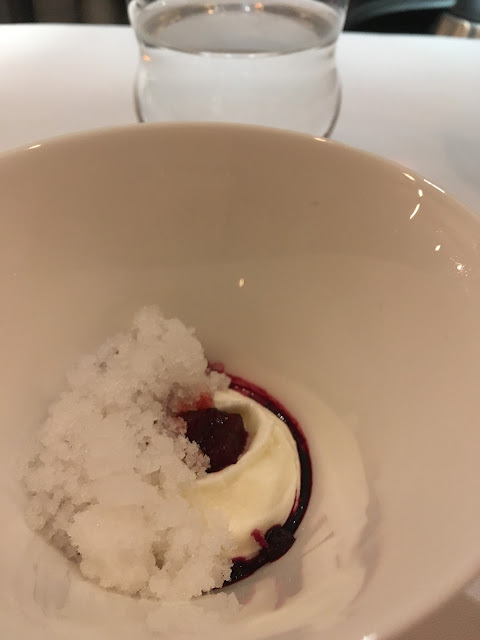 This was a bonus course from Chef. 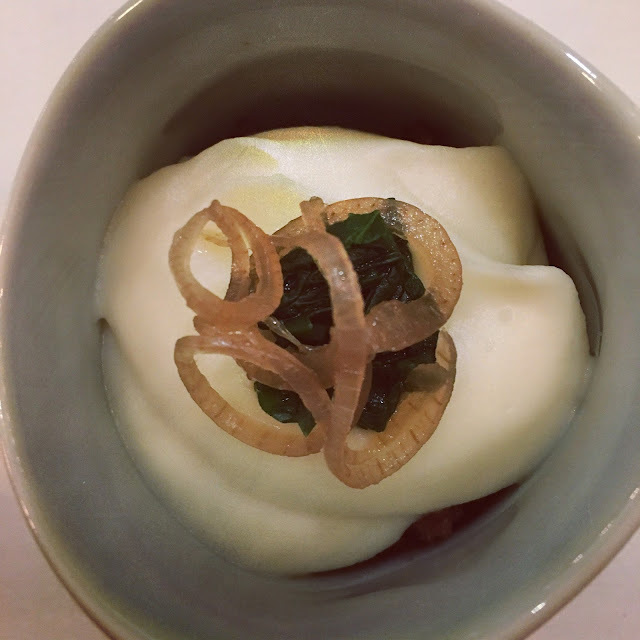 Ragu was made with Prime cuts of roe buck, topped with a parsnip purée. The purée was particularly tasty, excellent with the strong ragu. From where we were sitting we thought it read 'Tamworth' on the board, so we were both expecting something porky... Until chef presented the dish and announced Tunworth, which is a type of English cheese. Never would I have paired soft cheese with baked pear, but the result was astonishingly enjoyable. 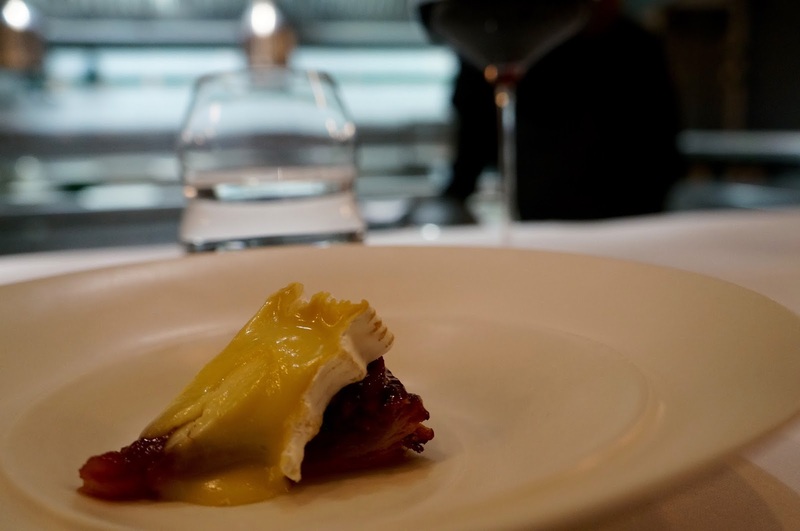 The cheese was not dissimilar to Camembert; the sweetness from the tart brought out the ripened flavours from the creamy cheese. It was a perfect synopsis to our sweet courses to follow. Caramelised Beetroot served with cream and shaved ice, floated in beetroot nectar. Sweetcorn and I aren't getting on right now. 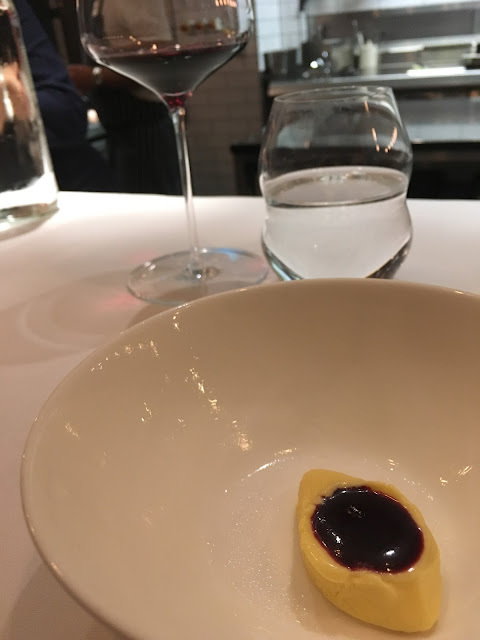 Though the whipped sweetcorn cream is a very clever use of the sugary ingredient, I wasn't mad about the sharp blackberry coulis. The two were at extreme ends and didn't work for me. Layers of apple were baked with caramel to construct a small squidgy, juicy bloc with a slight crunch. Served with the mildly bitter sorrel granitas and cream camomile. 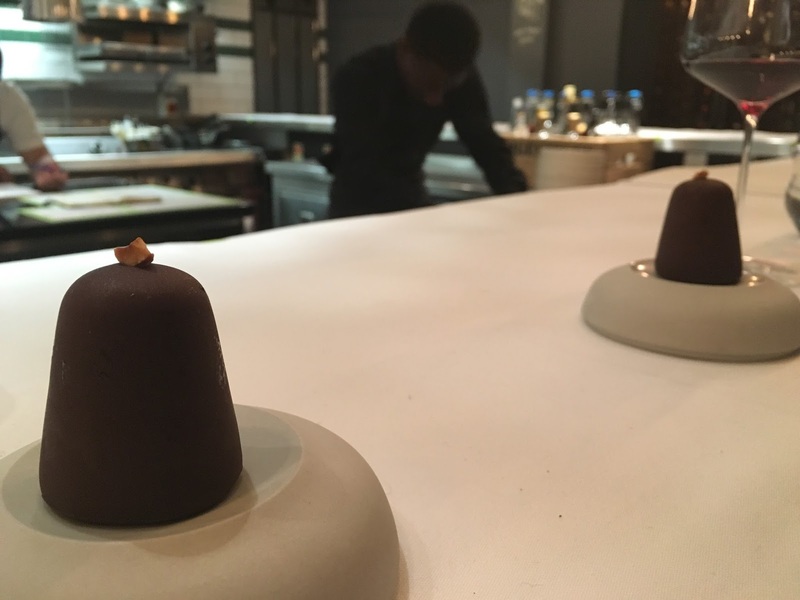 We finished with caramel, a posh choc-ice. When I confirmed the booking, I was given the option to pre-order cake for special celebrations. 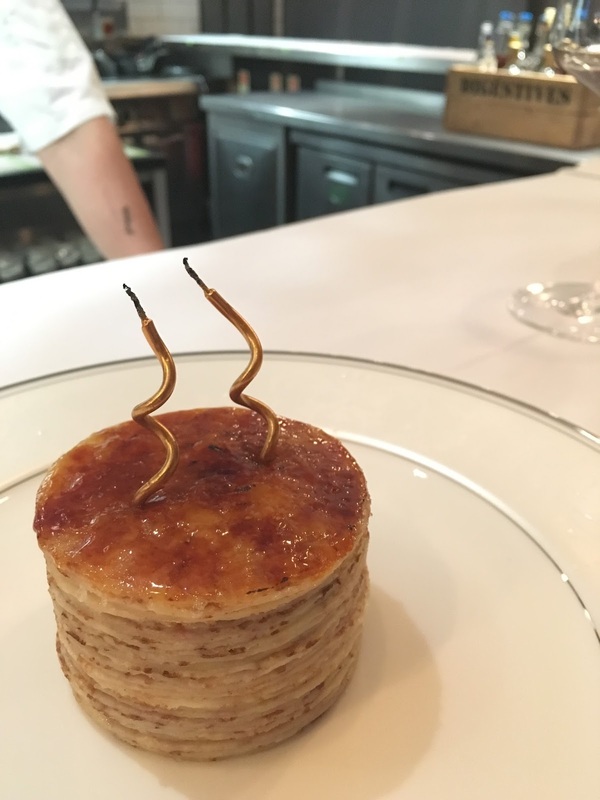 I had high expectations for the mille-crepe cake, hoping it was as good as Lady M's. Sadly it was quite disappointing; each layer of crepe was too thick and too doughy, so there wasn't enough cream to give it flavour. 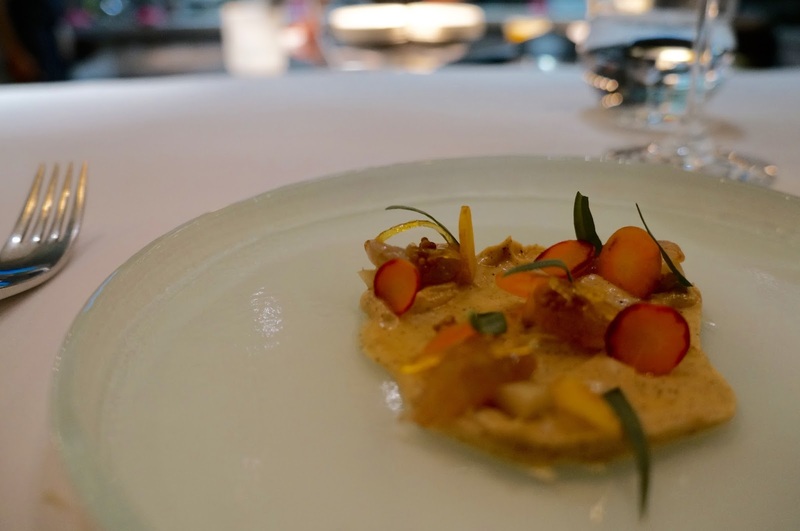 It was like eating a stack of soggy pancakes - not what we needed after a 14-course meal. Despite ending on a soggy note, it was a sensational meal and a thoroughly enjoyable dining experience. Food was overall excellent, some more impressive than others. It wasn't just about the food; it was great fun being able to interact with Chef and the team, and grill them about each dish. The front of house was charming, knew his stuff without being stuffy and was very friendly. The ambience was relaxed and chilled as we sipped on champagne and chatted with the team. It was almost 12 by the time we left. The most important bit - He enjoyed his birthday dinner. That's great ! I became hungry to see fantastic items, I love cooking and I also want to make recipe like this. Find the perfect Cooking Class Singapore for cooking the several signature dishes of all around the world.